The City of Sacramento is holding the last of four public meetings on Vision Zero and Bicycle Master Plan implementation tonight, January 31, 5:00 to 7:00PM at city hall. You can see the new Bicycle Master Plan and draft implementation plan at http://bit.ly/SacBicyclingProgram. 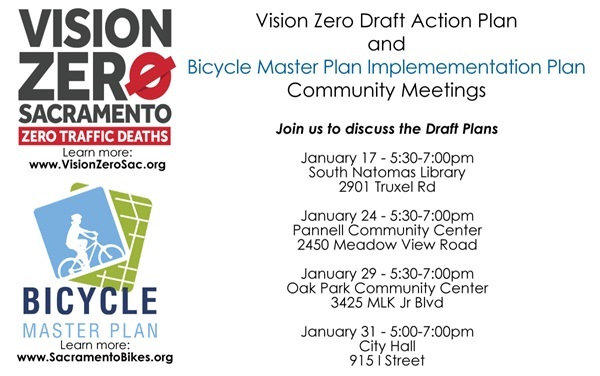 You can see the Vision Zero Draft Action Plan and other documents at http://bit.ly/VisionZeroSac. Just one of these would be reason to attend, but both! Hope to see you there.